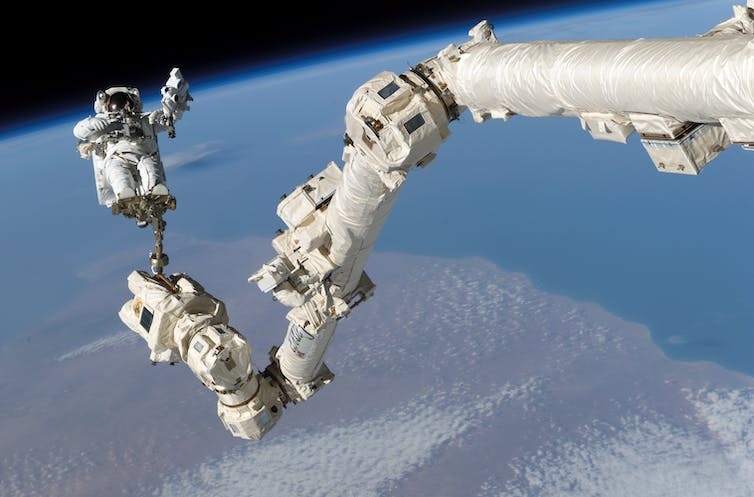 Developed in Canada during the Space Shuttle era, Canadarm2 is a robotic arm that is attached to the outside of the International Space Station. It is used for many tasks outside the space station to avoid astronauts having to complete high-risk space walks. This technology led to the creation of neuroArm, that can perform precision surgery inside MRI scanners, such as removing brain tumours. In space, the lack of gravity changes the way the eyes move and perceive motion. High-tech eye trackers were developed to see where astronauts look during their normal work in micro-gravity. Eye movements are a problem faced in corrective laser eye surgery. Eye trackers developed for spaceflight are now being used in corrective laser eye surgery to ensure correct laser beam positioning. Nitric oxide is a commonly found pollutant in the air, both on Earth and on the International Space Station. When a person has inflamed airways, as seen in asthmatics, an increase in nitric oxide is seen in exhaled air. The European Space Agency has developed a device that accurately measures nitric oxide in the exhaled air of astronauts to detect potential inflammation. This way, astronauts can be treated before the situation becomes more serious. 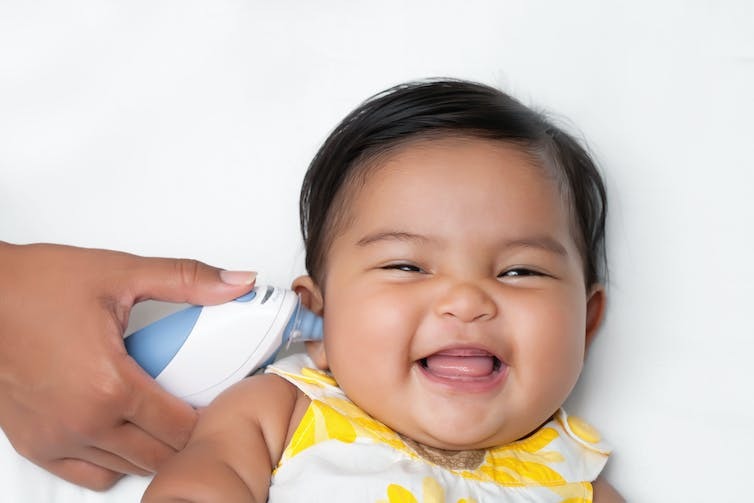 This technology is now being used in asthmatics to detect the amount of nitric oxide in their exhaled air caused by inflammation in their lungs. Without gravity acting on their bodies, astronauts experience massive loss in bone density that is similar to the bone loss seen in elderly people with osteoporosis. Attempts are made to reduce this bone loss through daily exercise. Astronauts have also shown that taking a small amount of bisphosphonate, weekly, further reduces bone loss. Pharmaceutical discoveries like this are already benefiting the Earth’s ageing population. Infrared technologies were developed many decades ago in NASA’s Jet Propulsion Laboratory to measure the temperature of planets and stars. In 1991, this technology was turned into in-ear thermometers. In-ear thermometers provide temperature readings in just a few seconds and have been shown to provide accurate temperature readings, making them ideal for use in hospitals, doctors surgeries and even at home. While investigating vision changes in astronauts, scientists discovered they occurred due to increased pressure inside the skull, which, in turn, is the result of an increase in cerebrospinal fluid volume. Flight surgeons needed ways to monitor these pressure changes easily. Research in the UK has led to a device that can measure the pressure inside the skull using displacement of the ear drum, which is non-invasive, quicker and can be done anywhere. Being in space increases the risk of kidney stones forming. In astronauts, kidney stones can cause infections and complications severe enough to require crew evacuation. Research with NASA has developed Star Trek-like hand-held ultrasound techniques that can detect, move and then pulverise stones making them easier to pass. This technology could benefit people with kidney stones on Earth, too. Translucent polycrystalline alumina. It’s a bit of a mouthful. This advanced high-strength, maximum-translucent, shatter-resistant ceramic was developed for defence and aerospace. It was suggested the material could be used for making translucent brackets for braces that would appear tooth coloured. After it was trialled, it became one of the most successful orthodontic products in history. Processing digital signals can be tricky. NASA pioneered high-tech digital-signal processing to help enhance lunar images to find the best Moon landing sites in the Apollo era. These signal processing techniques are now widely used in CT and MRI scanners to help doctors find injuries and cancers without needing to cut patients open to look inside. It is still being developed today. Water is heavy, so astronauts need to reduce the amount that has to be taken up to space from Earth. They achieve this by recycling and purifying most liquids on the International Space Station (including their urine). While developing these filtration systems, scientists applied the same technology to removing toxic waste from used dialysis fluid. This led to new dialysis machines that no longer need continuous water and drain connections, meaning they use less power and are portable, which enables use at home.